In our commitment to help every woman find products that will complement their beauty, we came up with our list of the best BB and CC creams for black women. We carefully studied and reviewed the products that made it to our list based on the amount of coverage they provide, overall feel on the skin, and friendliness on the budget. The Clear Complexion BB Cream by Aveeno is a dermatologist-recommended product. This hypoallergenic formula helps in preventing sunburn and minimizes the chance of skin cancer. Try the Stem Cellular CC Cream by Juice Beauty for a product that can be enjoyed by all skin types. It has SPF 30 to protect skin from signs of premature aging like wrinkles and fine lines. Choose Peter Thomas Roth’s CC Cream for 5 skin benefits rolled into one product. It boasts of its Vitamin C-rich Camu Camu content, which is secret for skin that’s more youthful-looking. 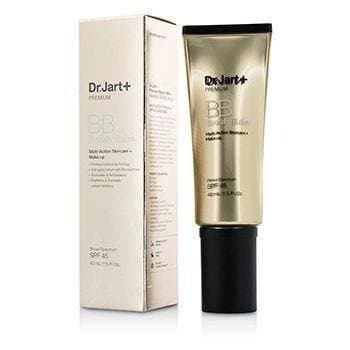 The Premium Beauty Balm SPF 45 (02 Medium-Deep) by Dr. Jart+ is our fourth choice. An Asian brand, it boasts of its bio-peptide complex that helps boost collagen production. The B﻿﻿ody Shop’s Tea Tree Flawless BB Cream works by covering imperfections and blemishes in an instant. It also participates in the Community Fair Trade that helps the people of Kenya. So, instead of checking out any random one you see, try out any one of these bb and cc creams for black women. If you’re wondering which bb cream is best for dark skin, this is the answer. Free of any oils and hypoallergenic, this product conceals and evens out skin for your most flawless look ever. Non-comedogenic, this BB cream won’t cause clogged pores which cause future breakouts. It helps conceal past acne marks, so with this product, the “dark” days of your skin are soon over. The secret lies in its patented Total Soy Complex formula. Dating back to Ancient China, soy has been used to lessen the appearance of discoloration and wrinkles for even-looking skin. A process was then devised in such a way that the integrity of its proteins is retained. The result is the said formula, which transforms dull, lifeless skin to skin that’s visibly more radiant. This product comes with a soothing, botanical smell to it and is beige in color. It has a very silky texture to it, so looking oily is a thing of the past when you have this one on. Sun protection is another thing that’ll help those with dark skin tones. This has an impressive SPF 30, which we think is a good amount of protection against the sun’s damaging rays. If you’re puzzled which BB cream might work for dark skin tones, then you have to search no more. If it worked for hundreds of women, it might as well work for you, too. This, for us, is the best CC cream for black skin because it is enriched with antioxidants. It also helps improve the skin’s elasticity as well as reduce the appearance of wrinkles and fine lines. Great for all skin types, this CC cream helps even out the skin tone and gives protection against the sun’s damaging rays. It contains mineral-based SPF 30 and is free of any possible irritants. Some of its ingredients include organic apple and lemon juice. The former is rich in antioxidants that aid in beautiful skin, while the latter helps improve and clarify skin texture and tone. It also contains Aloe Vera and organic sunflower oil. Aside from its soothing qualities, Aloe benefits skin by boosting its hydration levels while sunflower oil moisturizes and softens skin. This product also comes in 5 different shades. This is why we consider this as the best CC cream for black skin because no matter what your skin color is, there’s a shade waiting just for you. It is, however, unfortunate that this CC cream comes with a high price tag. But it doesn’t seem to matter as people with dark skin tones actually love and swear by this product. Your search for the best BB or CC cream for dark skin ends with this product. Aside from its antioxidant benefits, it also contains SPF 30 to protect skin from the sun’s damaging effects. If you’re searching for an effective anti-aging product, this CC cream is the answer. It contains Camu Camu berries, which are known to have 30 times more Vitamin C than regular orange. And in case you didn’t know, Vitamin C is crucial for brighter, firmer, and younger-looking skin. Unlike other creams that just don’t cut it with the coverage, this product works like a foundation with a matte, smooth finish to it. This is why people with oily skin will benefit from this as well. This CC cream has the power to make you look fresh the whole day. It has long-staying power (up to 12 hours!,) does not settle into fine lines, nor does it oxidize. This product comes in a squeeze tube and is very blendable and lightweight. We have to warn you though that it dries up quickly, so being a fast worker is an advantage with this product. Highly pigmented, this product is available in 4 different shades that cater to those with dark skin tones. Women of color will really be impressed with what this CC cream has to offer. This for us is the best Asian BB cream for dark skin since it contains a bio-peptide complex that is infused with gold. This helps combat the signs of aging and boost skin’s collagen production. Ideal for all skin types, this BB cream can benefit those with oily skin as well. This BB cream offers a lot of benefits in one tube, so you’ll definitely get your money’s worth with this in hand. Though an Asian product, this comes in a darker version to suit those with dark skin tones. It is packed with arbutin and adenosine which brightens the skin and boosts elasticity, respectively. In terms of consistency, we have to say it is quite runny yet is easily absorbed by the skin. This BB cream also doesn’t oxidize quickly and has wear that can last for up to 6 hours. We really love the high SPF it contains. People with dark skin tones tend to forget to wear sunscreen, so this product is a good reminder that they need it as well. As with other Asian brands, this BB cream only comes with a limited shade selection. But it doesn’t appear to be a problem, since most Asian products have this “tone adjusting” ability. Those who have dark skin tones will really love this BB cream. It isn’t your traditional “Asian product,” and you’ll be glad you gave this one a go. This is, hands down, the best BB cream for oily dark skin because of Tea Tree Oil. This oil has the same effect as benzoyl peroxide minus the harsh side effects like peeling and dried skin. Lightweight, this product leaves oily skin with a shine-free look and guarantees to cover skin flaws in an instant. It is super smooth, very blendable, and offers a light to medium coverage. This product has a subtle tea tree smell to it. It’s more of a personal preference, but we actually love it because the earthy scent kind of brings us back to Mother Nature. Do you have the same feel? If you’re on a quest for the best BB cream for dark skin tones, stop right now. Though it comes in 3 varied shades, this specific review already contains their darkest one so you’re good to go. We found it disappointing that it has no SPF. People with oily skin (or any skin type) can benefit from sunscreen, so we find it a hassle to apply two separate products to get the job done. Wondering which BB cream might work for you? You’re lucky because you got the answer staring right at you. Unless you’ve been living under a rock, you know how popular BB creams are. They are called the “miracle” product: claims of evening out skin tone, reducing oiliness, and so much more. Most BB creams come in light shades, so you’re probably wondering how it can benefit those with dark skin tones. Since BB creams can be considered “elder sisters” of tinted moisturizers, their benefits can range from having anti-aging qualities, moisturizing properties, or even providing sun protection. Women with dark skin tones often complain about uneven skin texture and dark spots. The sunscreen content in BB creams can keep dark spots from worsening and helps even out skin. Additionally, melasma is another concern BB creams can help with. These creams can even be used to conceal lesions from rosacea or acne. When an old white and an old dark woman are placed side to side, the latter will naturally look better. But have you thought how much better your skin would be if sunscreen was used daily? BB creams have light-refracting ingredients like dimethicone, silica, and pearl powder that make light bounce off. This decreases our chance of seeing flaws to make skin seem more radiant. A common mistake when picking a BB cream is to assume that one product will fit all. Because every skin is different, we recommend that you test the product first, especially the shade. What looks great on one person might be the exact opposite for another. We also think it’s a good idea to wear a traditional sunscreen first before applying a BB cream, since a “pea-sized amount” is not enough as sun protection. The same goes for moisturizers, since a “pea-sized amount” won’t help those with sensitive or dry skin. Some BBs claim to “regenerate” skin, yet research shows retinoids are the only ones who can do this. BB creams don’t contain retinoids, so for this, better use a separate Vitamin A cream. There’s no denying how versatile and economical BB creams are. But since they only provide a light amount of coverage, finding the one for women with dark skin tones can be challenging. The Clear Complexion BB Cream by Aveeno is the clear winner of this round as the best bb and cc cream for black women. Oil-free, it deeply moisturizes skin and evens it out to transform lifeless skin into radiant-looking skin. This cream contains broad spectrum SPF 30 for that ultimate sun protection. It however comes with a high price tag, but it doesn’t seem to matter considering how great this product is.